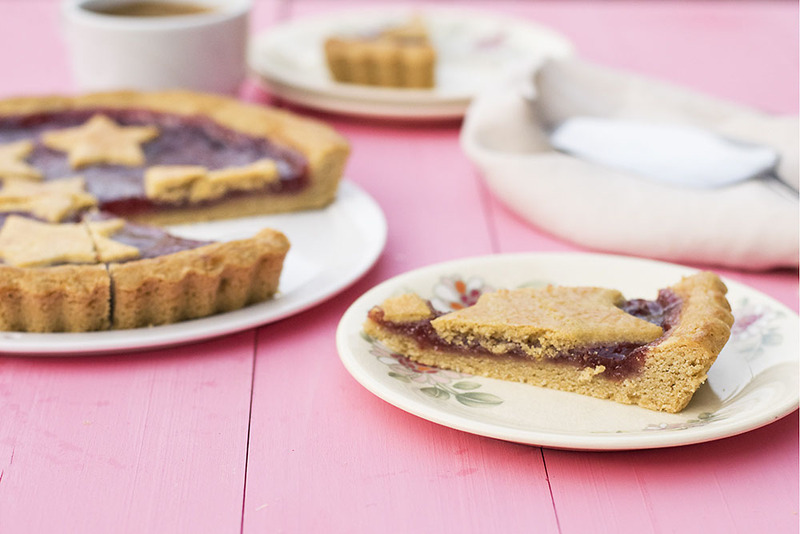 This jam tart with olive oil crust is a simple, easy, and delicious dessert! You don’t even have to roll out the dough! In Greece, this dessert is called “Pasta Flora”, probably due to misspelling from the Italian “Pasta Frolla”. But does the way you spell or pronounce a dessert really matter, especially when the dessert itself is very easy, quick and simple to make and it tastes delicious? I guess that some people are going to answer yes while some others are going to argue that they don’t care about names as long as their senses are satisfied. 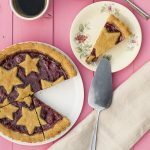 This jam tart has a crust made with olive oil, something that saves you the dilemma of using the butter straight from the fridge or letting it soften and also makes the dough soft and pliable in a way that you don’t have to roll it out, but you just press it with your hands to cover the tart pan. Of course, if you don’t have any olive oil in hand or just prefer to use butter for your sweets, you can use softened or melted butter instead, but I just have to tell you that olive oil is not only full of plenty good-for-heart monounsaturated fat but it also tastes really-really good, especially when combined with some ground cinnamon and maybe a bit of lemon zest. Take these Cretan almond biscotti for example; they are so fragrant and tasty they’ll become your next favorite cookie! Is anybody else having trouble cutting out the dough into ribbons and arranging them onto pies and tarts in a way that feels it requires surgical accuracy? If you want to save yourself some time and trouble, just take your favorite cutter and cut out shapes like stars, hearts, flowers or whatever works for you. Here, I have used 3 star-shaped cutters of different sizes and as you can see from the pictures the result was pretty nice! They also give this tart a cute Christmas vibe don’t you think? 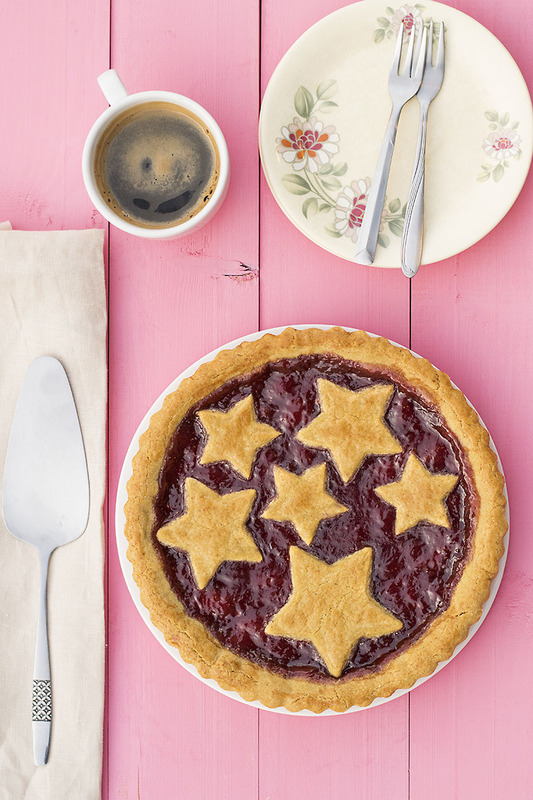 This recipe makes a 9–inch (22cm) tart. 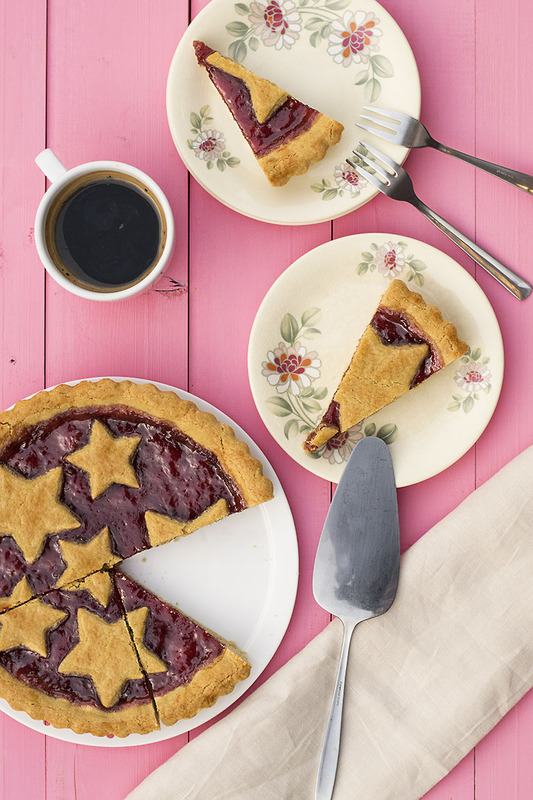 For a 12–inch (30cm) tart you’ll need to double the quantities. This recipe uses 2 teaspoons baking powder which results in a crust crispy on the outside and tender inside. Reduce baking powder to one teaspoon if you want it extra crunchy. 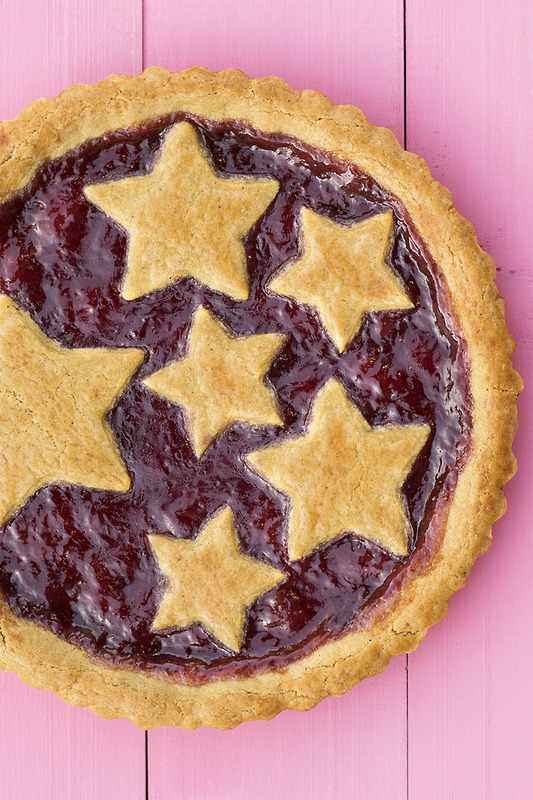 The stars make this tart perfect for Christmas! Enjoy it as an afternoon dessert with a cup of coffee or a big mug full of thick and velvety, real French hot chocolate. You can use softened butter instead of olive oil. Preheat your oven to 350°F (175°C) and lightly oil a 9–inch (22cm) tart pan. Transfer the sugar, cinnamon, salt and lemon zest in another bowl and mix with a whisk (a fork will do, too). Add the olive oil and vanilla and mix well. Break the egg into a small bowl, beat with a fork and add about the half of it into the oil and sugar mixture (reserve the other half for the egg wash). Whisk well to combine, add the flour and stir until the mixture is crumbly. Knead with your hands until a dough forms. If the dough is sticky, sprinkle with some extra flour. 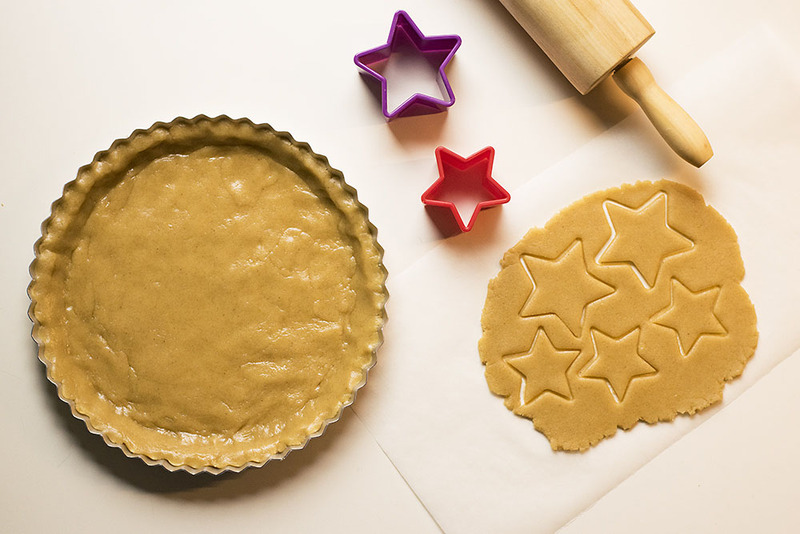 Reserve one-quarter of the dough for the decorations and transfer the rest to the tart pan. Press with your hands to cover the bottom and sides and flatten with the back of a spoon (or the back of your measuring cup). If the marmalade is too thick, stir it with a fork and add a splash of water to loosen it up, then, fill the tart. Roll the reserved dough onto a piece of baking paper and cut shapes of your choosing. Place them on the tart. Mix the reserved half of the egg with one tablespoon milk and a pinch of sugar and beat with a fork. Brush the dough decorations with the egg wash.
oooooh! What a lovely tart. Love the olive oil crust, how unexpected yet wonderful! Thank you Jessie! Expect the unexpected, haha!!! 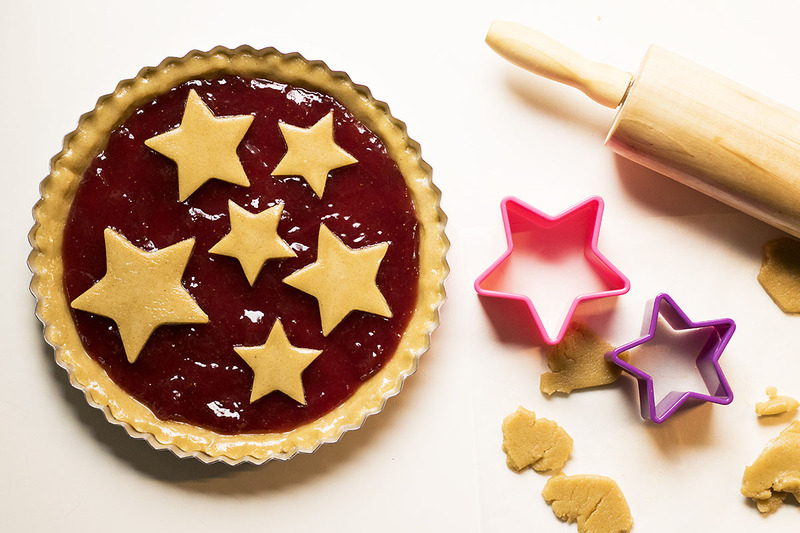 This jam tart is a great idea for Christmas time! And it looks very beautiful! I am loving your holiday recipe series. The crust looks wonderful..I can tell from the picture how good they are! I’m very glad you like it Akhila!!! I just love baking with olive oil but have never tried it with pastry! Do you think it is possible to alter the recipe to make mini tarts in a cupcake tray? (This would make it a lot easier for the kids to scoff down) If so, how much should I reduce cooking time by? I totally agree with you, olive oil is great for baking! I haven’t tried this recipe in a cupcake tray, but I think it can work. Keep in mind that this dough puffs up a bit, so you should make sure to leave enough space for the jam. For the cooking time, 25-30 minutes should be enough, or you can check with your eyes and take them out when the dough is golden brown. Also, traditionally, this dessert is cut in squares or rectangles (like bars). That can also be easier for the kids to eat.